Movie camera Univex 8mm, model A8. It was produced in 1936. It is equipped with a lens Ilex Univar 1:5,6. Its weight is kg. 0,650 and the measures are the following: 40x105x85 mm. It is very little and handy. The camera housing is made from zinc, the interior from stainless, brass and aluminium. It works perfectly. Movie camera Univex 8mm, model B8. It was produced in 1939. It is equipped with a lens Ilex Univar 1:5,6 12.5mm. Its weight is kg. 0,650 and the measures are the following: 37x105x85 mm. It is very little and handy. 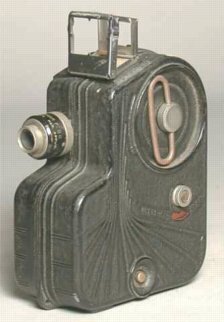 The camera housing is made from zinc and its colour is brown, the interior from stainless, brass and aluminium. It works perfectly. 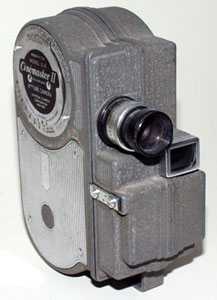 The Cinemaster II was produced in two models: the G-8 in 1946 and the H-8 in 1951. 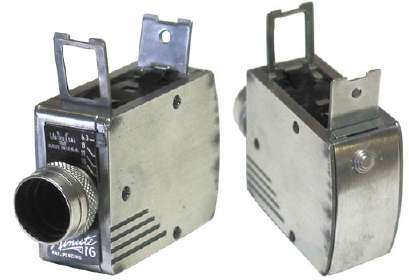 The first was very common, instead they produced not many cameras of the second model. prodotti meno esemplari. It is equipped with a lens Univcersal Univar 1:3,5mm. Its weight is kg. 0,850 and the measures are the following: 95x130x45mm. In 1946 the original price the camera was 51 $US. It is quite little and handy. The camera housing is made from zinc and its colour is grey, the interior from stainless, brass and aluminium. It works perfectly. 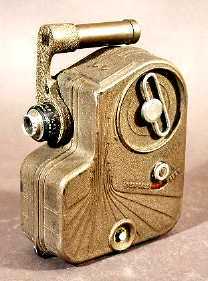 Movie camera Universal Minute 16mm, produced in 1949. Folding viewfinders are on top, like Kodak. It is equipped with a Meniscus f6,3-f11 Anastigmat fixed focus lens with guillotine shutter 1/50. It has the following measures: 70x44x25 mm (a bit bigger a match box!!!) and weights 160 gr.